In July 2015 I received an email from Emma J Wells, who had seen my Saints Way page. She was preparing her "Pilgrim Routes of the British Isles" for publication and asked if she might use some of my photographs.. Flattered, I was of course delighted to oblige. In late October 2016 I was thrilled to receive a complimentary signed copy of Emma's impressive book. Published by Robert Hale, it is printed on quality art paper. It pleases me greatly that my images have not only been featured in the chapter on the Saints Way but have been beautifully reproduced. Emma describes herself as academic, author, all-round ‘buildings detective’ and cultural heritage professional. She is all that but much more: she broadcasts on radio and TV and speaks and writes not just knowledgeably but also entertainingly and includes enough amusing asides to keep the reader interested throughout. Emma is Associate Lecturer in York’s Department of History and Programme Director in Parish Church Studies at the Centre for Lifelong Learning. She has spent much of the last 10 years walking and researching the UK’s famous and lesser known pilgrim routes, including St. Andrew's Way, St. Cuthbert's Way, the North Wales Pilgrims Way, the Pilgrims Way to Canterbury and the Pilgrims Trasil to Normandy. Her book therefore contains a great wealth of geographical, topographical, architectural and archaeological detail and has the feeling a of well and personally researched work, which suggests she has enjoyed some great walking. All that and, if her photo is to be believed, a very good looking young lady. 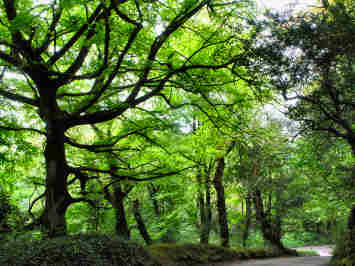 In Cornish 'Forth an Syns', in English 'The Saints Way', this trail was also known as the 'Mariners Way'. 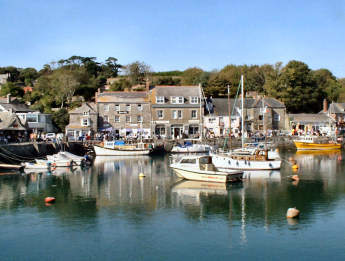 The 30 mile route links two important harbour towns, Padstow on the north coast and Fowey on the south. While there may be no evidence that this really was a route used by holy travellers and traders between Ireland, Wales and Britanny in prehistoric and early Christian times, it's a nice conceit and makes an enjoyable and different coast-to-coast route. 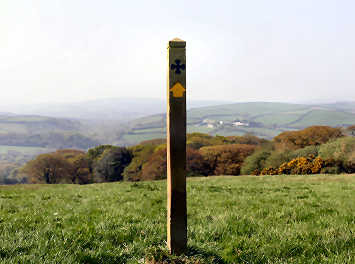 And it is fair to say that there are plenty of Cornish crosses and standing stones along the way, suggesting a possible ancient cross-country route. 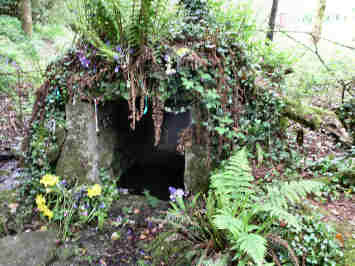 Created in 1986 by a group of Cornish hikers and students of history, the Saints Way has the support of the Cornwall Council and was upgraded and improved in 2006. 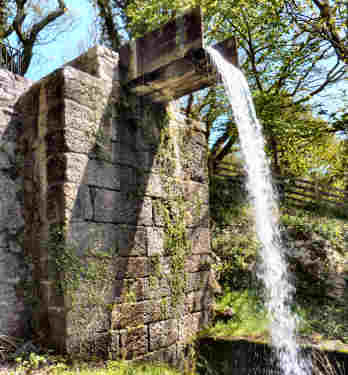 Having completed the Cornish Coast Path in 2005, and Mark Camp's Bodmin Moor Copper Trail in early 2006, the Saints Way was my May/June 2006 project. It gets complicated at Helman Tor as you then have a choice of two routes to Fowey, one east by Luxulyan, the other west by Lanlivery; I can find reasons to prefer either route but rather favour Luxulyan. As with the Copper Trail, I have just posted a few images of each section, along with a short description. It was good walking and mostly fairly easy. 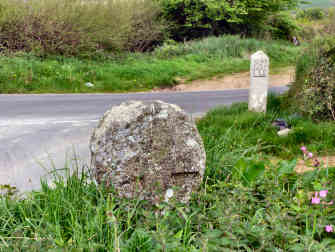 Waymarking is mostly clear, using a black cross and yellow direction arrow, but is a little lacking in places and confusing in some others. The original bible of the trail is a hundred page booklet, prepared by Michael Gill and with historical notes by Stephen Colwill. One way or another, many others were involved - Cliff Townes and Alf Fooks, who had the original inspiration, the Ramblers Association, the Institute of Cornish Studies, the CRS Community Programme, even the Cornish Gorsedd of Bards. This guide, at over 100 pages, is not ideal to carry with you but is well worth reading through for history and background. Its maps are indistinct. The essential guide now is the Saints Way Guide, compiled and published by Ginny and Heulyn Lewis of Pelican Studio. A compact folder with 8 trail cards (and 5 information cards), each trail card covers about 5 miles, has a good map and accurate description. There are good small photographs and information on points of interest along (and just off) the way. The folder and information cards cover the saints, pilgrims, church features, man and the landscape, wildlife and nature reserves. As the folder suggests, you should carry OS Explorer maps 106 and 107 with you. I have three criticisms of the Saint's Way - too much road for my taste, occasionally unclear waymarking and too few decent pubs along the way except in Lanivet, Lanlivery and Golant. The guide cards that I have, the compact folder referred to above, begin the route at Padstow's harbour and, indeed, you should not visit Padstow without seeing the lovely sheltered harbour. However, the route actually starts at St. Petroc's Church where, just through the south lych gate, is the first Saint's Way direction sign and a fairly ancient route map. 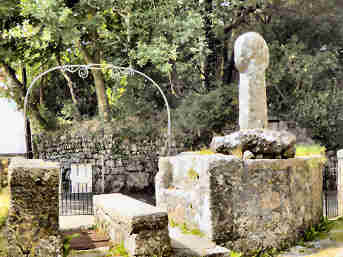 Before setting off, I suggest looking around the churchyard, where there is a Cornish Cross near the porch and the massive base and part-shaft of another by the south gate. You might also like to take a look at the Cormish Cross at the edge of the lawn at Prideaux Place. This was one of the few sections on which I was able to use public transport, taking the bus from Wadebridge to Padstow to start. Relatively easy walking with generally clear paths but waymarking has deteriorated in places. 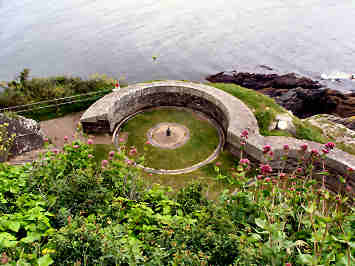 A gentle climb up to the Victoria Golden Jubilee monument on Dennis Hill for views of Padstow and the Camel Estuary. 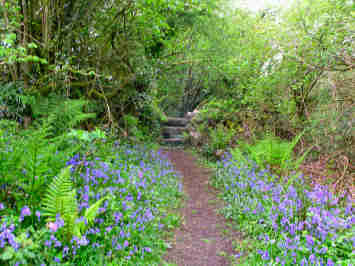 Easy descent to follow Petherick Creek to Little Petherick, bluebells in the woods. 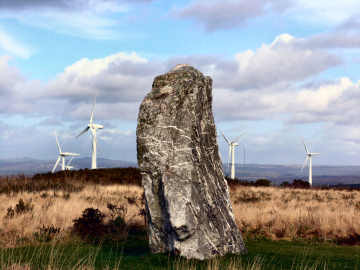 Long easy climb up through Melingey and Blable to cross the A39 to St. Breock Downs - neolithic burial cairns, longstones and a wind farm. A good start. With no public transport to help with this section - I would have preferred to continue to Lanivet - I parked by St. Breock Downs Farm, followed the Way as far as Tremore Cross, and made my way back to St. Breock Downs by the charming hamlet of Ruthernbridge. The Way took me mostly cross-country down into Tregustick valley, up to Withiel village (on the Land's End Trail) then down and up to Tremore Cross. On a warm mid-May 2006 day, the countryside was lovely and wildflowers included pink and white campion, bluebells, alium and buttercups. I have never seen so many Cornish crosses in one day - very appropriate to the Saints Way - 2 ancient ones in Lanivet churchyard, the one below at Reperry crossroads, and others at Tremore crossroads, St. Inunger Farm and in Fentonpits village. And fascinating direction signs, too, at Reperry. 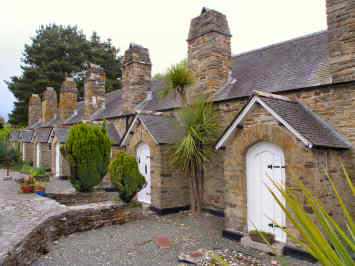 You will find images of these and Cornish crosses on my Miscellanea page. This section included rather a lot of road but I was able to compensate with paths across Breney Common and Innis Downs on my return route. Here's where it gets a bit complicated. At Helman Tor the way divides. An easterly branch heads for Fowey by Lanlivery and Golant. 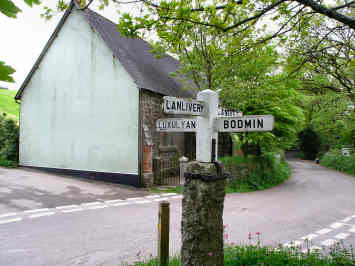 A westerly branch goes to Luxulyan and on by Tywardreath to Fowey. I have done both routes but in bits and pieces. I decided to do a bit of each route as a triangular walk from Helman Tor to Lanlivery, cross-country to Luxulyan and back north to Helman Tor. 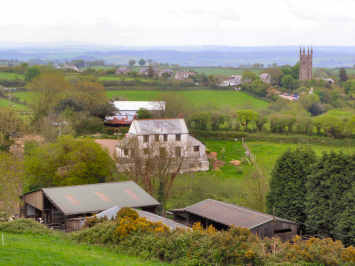 To Lanlivery, a charming small village, it was mostly on a high-banked green lane with occasional long views. 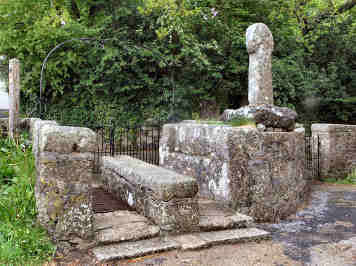 A detour to St. Brevita's Well, then fields and lanes to Luxulyan, a village of no interest, except for the church's lych-gate and Cornish cross. 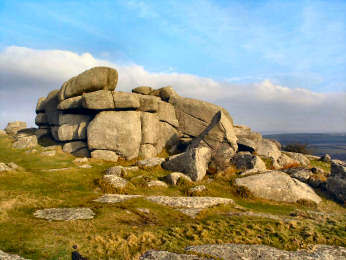 Helman Tor was reached first through bluebell woods, then mostly by lane. With (again) no buses to help, I actually walked this as a 12 mile out and back - my own route from Par Sands to Luxulyan, returning on the trail to Polmear and Par Sands. The official trail may be more authentic but I would not, for the worlds, have missed Prideaux, the road up Luxulyan Valley and the great Treffry Viaduct. If you are sticking to the trail, please do take the detour to the viaduct and adjacent woods; it is well worth it. On the other hand, it is not worth bothering with the trail's suggested Prideaux Fort detour. The big problem with the official Saints Way route between Luxulyan and Par Beach at Polmear is that there is an awful lot of road for much of the last 3 miles through St. Blazey and Tywardreath. And, apart from Tywardreath village, it's also not a little boring. A perfectly good alternative exists, filled with interest, highly scenic and with only a few yards of road to mar one's enjoyment. 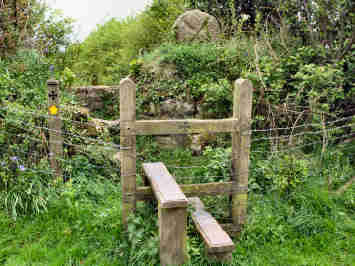 A little over half-a-mile south of Luxulyan church you come to a wooden stile and six steps down to a Saints Way waymark. Follow the WM and the next one into woodland then, shortly before a clapper bridge, leave the Saints Way and keep left to a tunnel under the embankment of the former railway. Climb a sort of step stile up to the railway embankment and go right on the former railway. 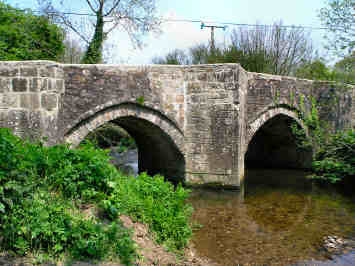 In a short while you will cross Treffry's magnificent viaduct and aqueduct. Once across it, keep going till you come to Carmears Wheelpit on your right then continue down Carmears Inclined Plane and on to a car park at Pont's Mill. Before you come to the wheelpit there is a section of Carmears Tramway where Cornwall Council has cleared debris to expose granite setts, rail shoes and even stretches of rail in places. Fascinating to see but making walking two abreast a little difficult. At Pont's Mill follow a lane through the car park, cross some rails, go under the railway and continue to Tywardreath Highway. Cross and follow Par Canal to St. Andrew's Road and on, crossing the railway, to Par Green. 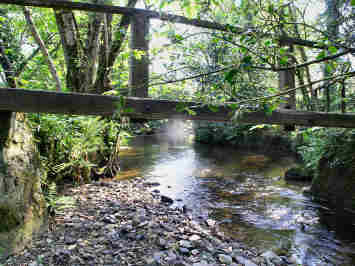 Go L and look for a footpath on the right leading to woodland and to Par Beach. It's certainly a lot more interesting than the official route and it's shorter, too. Carmears Wheelpit, well worth a closer look OS Explorer 107. Full Route Directions with distances and grid refs. Joseph Thomas Treffry of Place in Fowey - known as the 'King of Mid-Cornwall' - owned tin mines, granite quarries and china clay quarries. To serve his industrial sites he built a rail road from Par to Newquay (where he built the harbour). 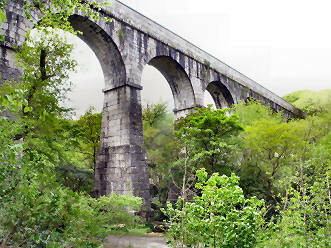 Greatest feat among many was the completion in 1842 of the Luxulyan Valley Viaduct - 10 arches, 700 feet long, 100 feet high - which carried a still-working aqueduct below the track bed. 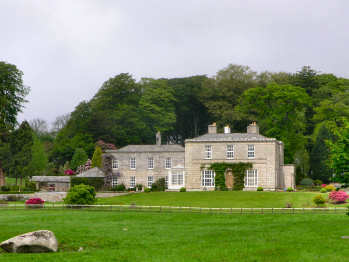 The walk up the beech-wooded valley from St. Blazey is a delight, ironically passing Prideaux, the then new and fashionable home of Treffry's arch-rivals the Rashleighs. You can walk over the viaduct; the Par-Newquay line now runs in a cutting below. I had walked this section previously but in two parts during two different walks. So I decided now to do it in one go, making a round walk by returning along the coast path by way of the Gribbin and Polkerris. 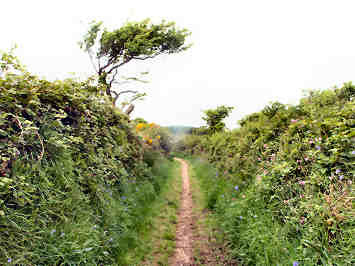 After a gentle climb up past Kilmarth to Tregaminion, the walk is largely level until descending through woods to Readymoney Cove. Urban then to Fowey. It was a dull day so the photos are a bit dull, too. 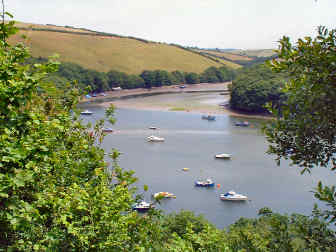 In fact, in June 2005, I walked this first in the other direction, parking in Golant, on the banks of the River Fowey. It proved to be a far tougher walk than I had expected, with ascents of 300 and 400 feet (steep) and 500 feet (gradual) between Golant and Lanlivery. Much easier in the trail direction, Lanlivery to Golant. 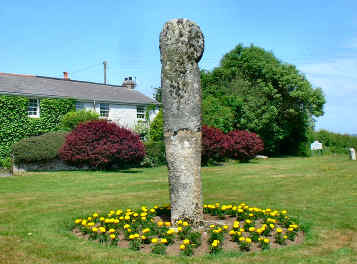 Starting from Lanlivery - the Crown is a good pub - first interest is at Nomansland, site of Pelyn Cornish Cross and a milestone in Roman numerals. Beware the busy 3-lane main A390, traffic passes at 60 or more mph. I then avoided a farmyard at Crewell, full of slurry and cows, by cutting across a corner by a field to the lovely green lane down to Castle and Milltown with its attractive cottages. Around here I made two detours, the first to find Milltown Viaduct, the second to see historic Lantyan Farm. 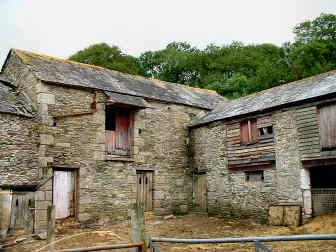 The farm was the putative site of King Mark's palace; the barns in the photo are ancient enough but the farmer told me another may date from around 1200. 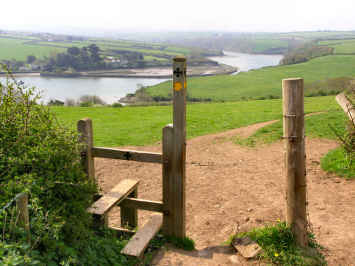 From the top of the hill by Lantyan Woods there is a view across the Fowey to St. Winnow. I also stopped to look around St. Sampson's Church, high on the hill above Golant. 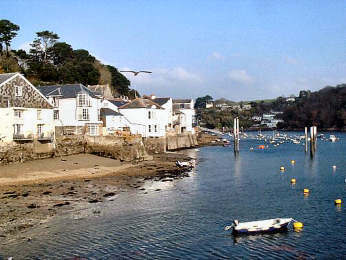 Golant has car parking (high tide can flood it) and a nice pub, the Fisherman's Arms. This was my very final section of the Saints Way, walked at the end of June 2006 as a simple short out-and-back from Golant. At the start I climbed gently to follow woodland above the River Fowey (few views) to Bodmin Pill, from where Bodmin merchants exported goods to avoid harbour dues at Fowey. I then climbed fairly steeply through beech woodland and across a meadow to around 350 feet before following a gentle narrow lane down to Bodinnick ferry and Fowey. I enjoyed coffee in the sun on the terrace of the Galleon Inn, watching the activity on the water, then back to Golant for more coffee (and cricket on the TV) in the Fisherman's Arms, where there is a promising seafood menu.